Our third day in Dubai was quite an interesting one. We spent the morning at the Jumeirah Mosque, where we got a tour and received an interesting talk on Islam, the local culture and what the various aspects of their lives are really like. It was fascinating. In the early afternoon we headed over to the Jumeirah Souk to wander and have lunch, then spent some time on the beach near the Burj Al Arab. After chilling at the hotel for the late afternoon, we headed out in the evening, back to Dubai Creek and the old souqs to experience things at night. 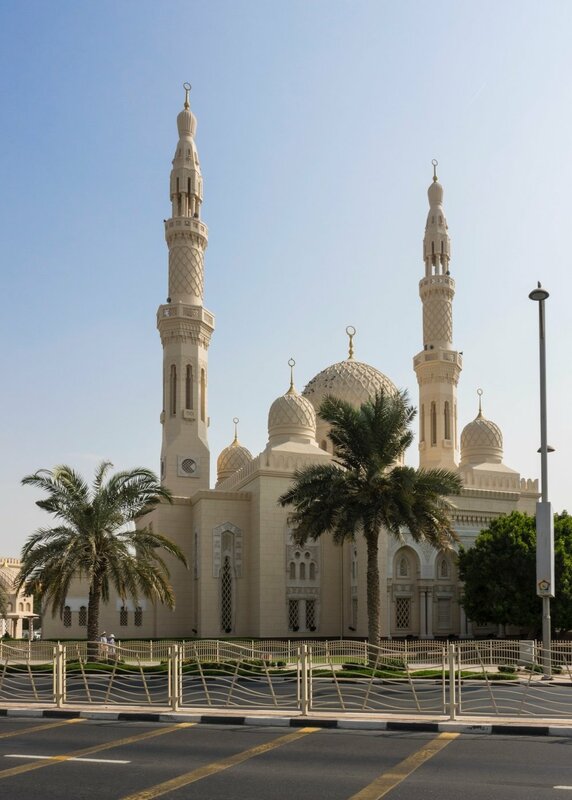 The Jumeirah Mosque is one of the most important buildings in the city ("buildings" isn't quite the right word here, but I'm at a loss for a better one), and we had heard very good things about the cultural program they run for tourists. So Wednesday morning we headed over to the mosque to check it out. It is a beautiful building, and I was quite excited to see it up close for the first time. We arrived at 9:45 to register for the tour, and it was already quite busy. There ended up being a good 25-30 people, from a broad spectrum of backgrounds. Before the tour started, they provided an interesting assortment of refreshments - tea, coffee, dates, a type of pancake and camel's milk cheese to go with it. It was all very interesting. The woman that lead the tour was very interesting and engaging. She's part of a group called the Sheikh Mohammed Centre for Cultural Understanding. In addition to running tours of the Mosque, they run cultural events in the city, bringing together people of different beliefs to try and promote understanding and acceptance. OUr tour ended up being a bit unique, as the founder of the Centre ended up leading the tour, and giving the talk. The woman that lead much of the tour - she was excellent. A slightly different view of the mosque, from the outside. Once the refreshments were done, they took us to the cleansing area where they walked us through the whole ritual they go through before they pray. From there, we went into the mosque, and he took us through the whole prayer ritual, piece by piece. He explained what they say and do at each step, which was quite interesting. He also took some time to explain what a mosque is, the expectations of Muslims (praying 5 times a day), and how that fits into the life of everyday people. It's not my thing, but it really is interesting to understand it, which was the goal of the program. Justine all set to enter the mosque. It was just before lunch time when we wrapped up. It was one of the best things we have done so far, and both of us were very glad to have done it. Once we left the mosque, we hopped back on the tour bus and headed over to the Souq Madinat Jumeirah. This is a modern take on the old souqs - a big shopping mall designed to look like a souq. 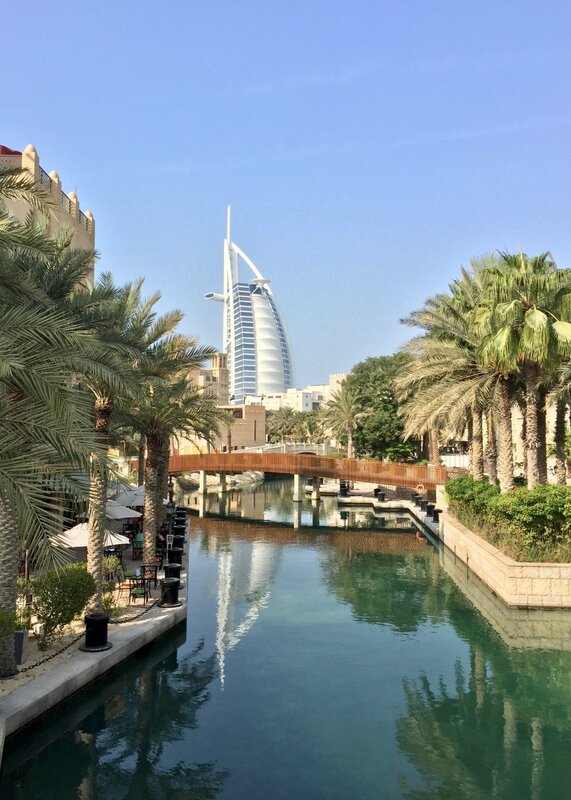 There was a set of canals running through the place that gave it a nice feel, and from a few places there were great views back over to the Burj Al Arab. We wandered for a while, trying to find some interesting things to bring home with us. Not with a lot of success. They we stopped on a patio overlooking one of the canals and had some lunch. After lunch, we walked over to the public beach at the foot of the Burj Al Arab, and put our feet in the ocean and relaxed for a bit. Justine collected some fun sea shells, and we walked up the beach for a while. Eventually we hopped in a taxi and headed back to the hotel. We chilled out in the hotel for a while while deciding what to do with the evening. As it was our last day in Dubai on this part of the trip, we decided to head back down to the old part of Dubai Creek, and check out the old souqs at night when things come alive. Heading up through the narrow streets towards the mosque. 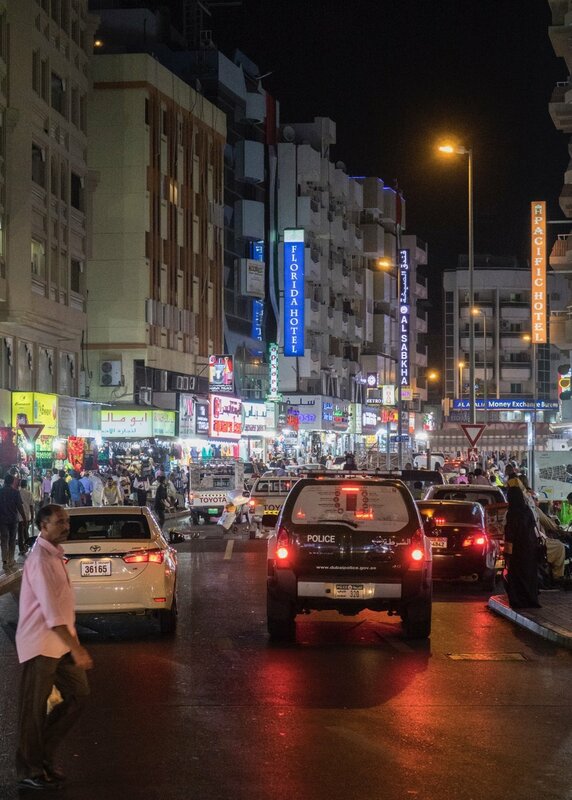 We took a taxi back to Bur Dubai, and wandered the narrow streets out to the abra station. We took one of the abras back across the Creek - such a good deal! From there, we headed back into the Gold Souq which was much more alive at this time of the day. We saw the world's largest gold ring - 58kg and worth more than $3M. It's awful, bit fun to see. Justine ended up buying herself a much smaller gold ring, both for her birthday and as a reminder of our trip. She did really well negotiating the price down! Just one of the many gold shops. From there we basically wandered the streets, going where ever something intersteding took us. We discovered the "Covered Souq", and indoor souq that seemed to have mostly items for locals. We also figured out that the old part is organized by types of stores - all the stores selling the same type of merchandise is in roughly the same area. Eventually we made out way back out to the Creek. The dhows that have been converted to floating restaurants were all out in force, going up and down the Creek decked out in bring lights and adding a festive feel to everything. Sadly, it was time for us to head home, so we grabbed an abra and eventually found a taxi back to the hotel. We needed to pack, as we had an early start to the day! The Dubai skyline from near our hotel.